Well, it appears that this will be my last "Months as Mommy" post as we'll be starting the monthly updates all over again from scratch with Baby 2.0! It's such a bittersweet feeling to know that my baby boy isn't really a baby anymore and welcoming his little brother into the world in two-ish months is going to officially put an end to that chapter of our lives. I loved becoming a Mommy to Charlie and I couldn't have asked for a sweeter, and more perfect little boy to usher in this era of my life. However, I also feel ready to be a Mommy times two. I know I've mentioned it before, but I was never someone who wanted to have an only child and always knew that I would want at least two children to complete our family. So this soon-to-be baby of ours kind of feels like a missing puzzle piece, which is also why even though we weren't trying for a second baby, we also weren't trying very hard not to have one. But I'm getting off topic. Today is all about you, Charlie Davis, and the wonderful 18 months we've shared together! Happy 1.5 years, baby boy! Charlie was a late bloomer in terms of teething, but has more than made up for it in the last few months. This little monster has sooo many teeth! His vocabulary has also completely taken off and he's developed quite the repertoire. Some of the funniest are "bee" which is any flying insect that he happens to spot within a mile radius. Seriously, this kid is observant, "nack nack" which is snacks, "boobie" which is what it is, but he doesn't discriminate between men and women when identifying their boobies! Haha He's mastered a lot of his family's names, too, though he still has trouble with "Grandma," "Grandpa," and his aunts. The last couple months have been quite the transition for us! Charlie's Aunt Ashlee went back to work full-time so we were unexpectedly without secure childcare. Thankfully, the timing worked out pretty perfectly because my sister had just graduated from grad school and was temporarily homeless while she job searched. Aunt Kelly has been living with us for the last month or so and watches him at our house during the day. Charlie seemed a little lost without his cousin Lucie to play with for the first week, but quickly adapted to being at home with his "Auntie K."
Auntie K finally did land herself a job, so this week, Charlie starts with a new sitter until I go on maternity leave. Fingers crossed it all works out because figuring out childcare is sooo stressful!!! 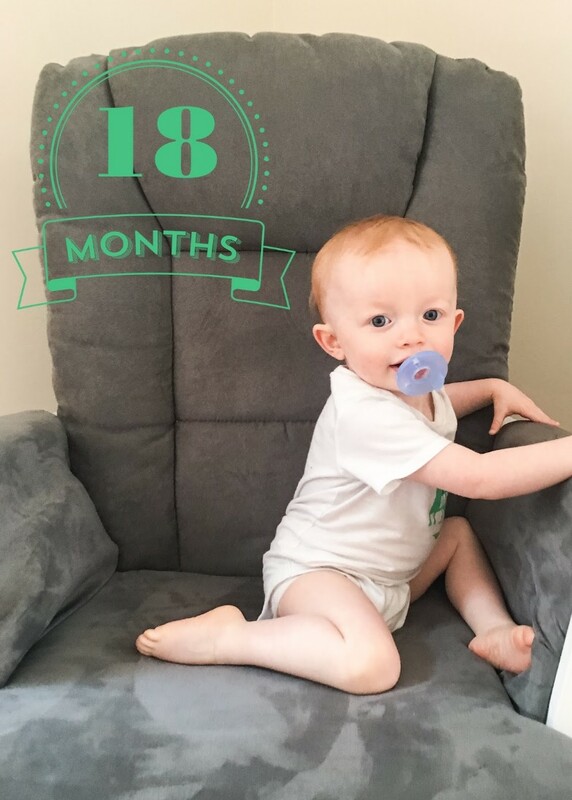 Charlie's 18-month appointment was yesterday and the nurse measured his height at 31 inches (up two from his last appointment!) and his weight at 19 lbs even. He's still hanging out below the growth curve for weight (no surprise there), but he's actually moved up to the 10th percentile for height. I knew there had to be a reason I've had to buy all new 18-month rompers lately! He's still wearing size 3 diapers, is now in size 4 shoes and he's in pretty much all 18-month clothes, with the exception of a few 12-month sized shorts. My Mama heart is going a little nuts at the thought of Charlie being a full-blown toddler, but I actually feel pretty confident that he's going to transition well into big brother mode. Charlie is such a sweet, lovable kid who charms the pants off everyone he meets. He loves other kids and I think is going to love having a new baby in the house. He's still pretty young so I don't know that he necessarily understands what's about to happen, but we've been trying to get him used to the idea that there's a baby in Mommy's belly. I was talking to him about it the other day and without any prompting whatsoever, he planted a huge kiss on my tummy. I just about melted right then and there! Charlie Davis, you will always be the sweet, ginger-headed baby who made me a Mommy and I am so thankful for that. I am so excited for this next phase of our life together. Keep being your gentle-hearted, good-natured self and you are going to do beautiful things in this life!